After an outstanding regular season and deep ACC Tournament run, Florida State entered the ACC Tournament needing just one win to break the school record for victories in a season. Against No. 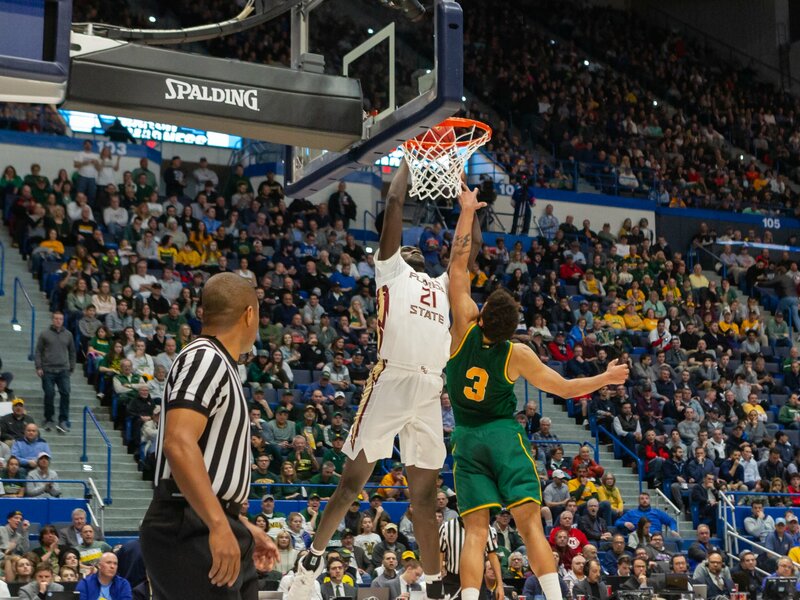 13 seed and American East champion Vermont in Hartford, the Seminoles were forced to work, but ultimately prevailed. FSU trailed 16-7 early but fought back to even things at the break at 27. In the second half, FSU trailed with less than 12 minutes to play, but a 15-6 run created some breathing room for the Seminoles. FSU led by as many as 13 in the second half. Mfiondu Kabengele and Terance Mann combined for 40 points and 18 rebounds as FSU notched its school-record 28th victory. 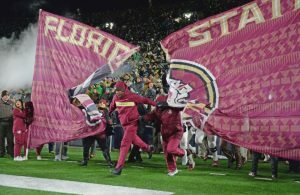 Top-20 teams met in Tallahassee for the ACC/Big Ten Challenge to cap the month of November. The Seminoles started strong, leading 44-32 at the break, but a myriad of triples by Purdue’s Ryan Cline and Carsyn Edwards helped the Boilermakers take a 72-64 lead with less than four minutes to play. FSU would keep Purdue off the scoreboard for the remainder of the contest. After a Trent Forrest steal with less than 20 seconds to go gave the Seminoles the ball back down 72-71, Forrest went to work on the offensive end, hitting a runner in the lane with six seconds remaining. Forrest then stole a cross-court pass on the final possession to seal the victory, which was capped with a 9-0 Florida State run. It was a match-up of to-20 teams in the AdvoCare Invitational in Lake Buena Vista between Florida State and LSU. FSU led 30-29 at the half, but trailed by nine with less than three minutes to play and four with just 32 seconds remaining in regulation. M.J. Walker was able to hit from distance to cut the lead to one with 18 seconds to go. After Tremont Waters split a pair of free throws for LSU, FSU was able to force overtime on a driving lay-in by Trent Forrest with two seconds to play. FSU led 76-73 late in overtime, but Waters was able to draw a foul while attempting a 3-pointer. He proceeded to knock down all three foul shots to tie the game with 11 seconds remaining. On FSU’s final possession, Mfiondu Kabengele was left open in the corner from distance and managed to get the roll with less than a second to play to cement the Seminoles’ spot in the tournament championship. 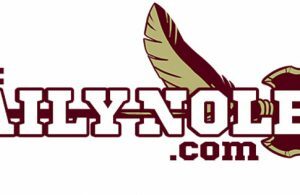 Entering the ACC Tournament semifinals against Virginia on March 15, FSU had defeated the No. 1 seed just once in the ACC Tournament and had reached the ACC Tournament final just twice in its history. Against a Virginia team that dominated the Seminoles in Charlottesville to open ACC play, both of those things changed. FSU led by 10 in the first half and 35-31 at the break, but the Cavaliers rallied to take a 45-44 lead with more than 13 minutes to play. FSU regained the lead with five straight points and after a 3-pointer from Virginia’s Ty Jermone made it 49-48 Florida State with about 12 minutes to play, the Seminoles answered with a 13-1 run to seize control and cruise to the ACC title game. David Nichols led four Seminoles in double-figures with 14 points on 6-for-8 shooting to go with three assists and two steals. Phil Cofer added 11 points and made three of the six FSU 3-pointers. Trent Forrest and Mfiondu Kabengele each finished with 10 points and six rebounds in the win. It was just Virginia’s third loss of the season and first to a team not named Duke. 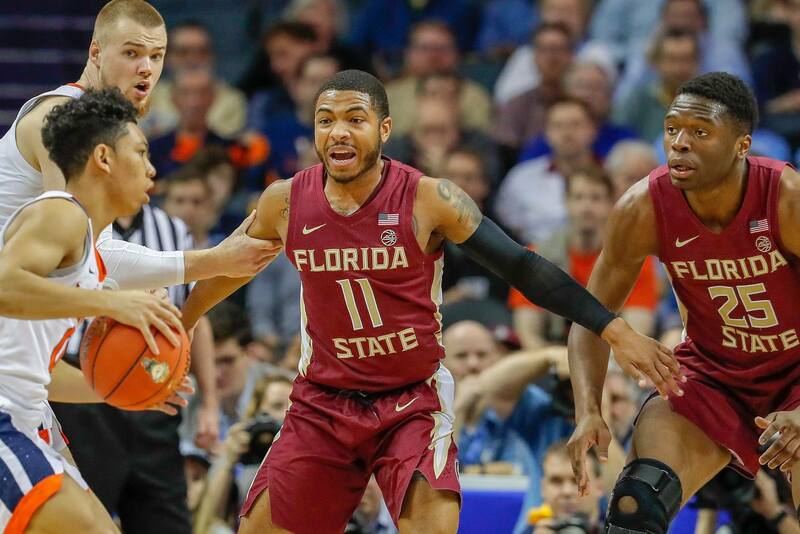 In a rematch of a contest that had decided a double-bye in the ACC Tournament nine days prior, Florida State opened its trip to Charlotte with a contest against Virginia Tech. 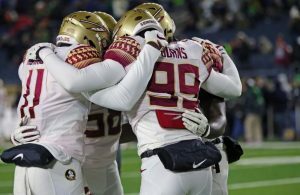 The Seminoles had rallied from 14 points down to top Virginia Tech in overtime on Senior Night in Tallahassee and up until overtime in Charlotte, the roles were reversed from the first meeting. In the first meeting, FSU trailed by 14 at the break, but a 13-0 run gave the Seminoles an early 17-4 advantage. That lead was cut to 26-24 at the break and Virginia Tech took its first lead late in the second half with six straight points from Kerry Blackshear. Leading 56-53, Blackshear had the chance to put the Seminoles away after being fouled on the third of three straight field goals, but missed the free throw. As Virginia Tech’s Ahmed Black did in the first meeting, FSU freshman Devin Vassell was able to force overtime with a trey as time ticked away in regulation. The Hokies went up 63-60 in overtime on a 3-pointer from Nickeil Alexander-Walker with less than two minutes remaining, but FSU’s Phil Cofer answered with his own triple on the other end. Alexander-Walker missed a chance to put Virginia Tech ahead with less than 15 seconds to go, giving FSU the final shot. 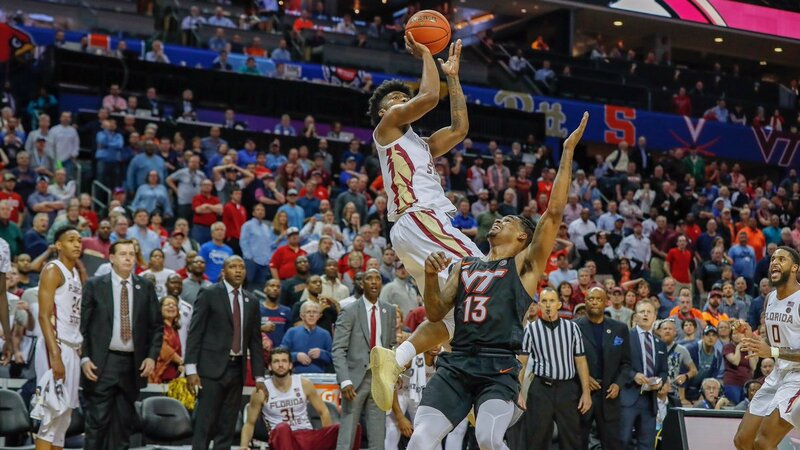 With time ticking away, Terance Mann got the roll on an off-balanced jumper with less than two seconds to play to give the Seminoles the comeback victory and to cement its second trip to the ACC semifinals in three years.